Are you struggling to lose weight despite a clean diet? Overly sensitive to cold weather? Is the outer 3rd of your eyebrow thin or completely missing? Do you experience low energy, fatigue, constipation, hair loss, dry skin, anxiety or depression? If so, you may be suffering from a low thyroid function aka hypothyroid or Hashimoto’s thyroiditis despite what your labs tests indicate. A healthy functioning thyroid is vital to your health; it’s the master gland of metabolism and the body’s internal thermostat, regulating temperature by secreting two hormones, T3 and T4 that control your metabolism. Every cell in the body has receptors for thyroid hormone. The thyroid controls energy levels, weight, metabolism, body temperature, heart rate and menstrual regularity. Thyroid hormones directly act on the brain, the G.I. tract, bone metabolism, the cardiovascular system, liver and gallbladder function, hormone production, glucose metabolism, lipid and cholesterol metabolism, protein metabolism, and body temperature regulation. The thyroid gland is a butterfly-shaped, hormone-producing tissue the size of a walnut located at the lower front of the neck just below the Adam’s apple. Every cell in your body needs small amounts of thyroid hormone to function optimally. Hypothyroidism is a condition where there’s insufficient thyroid activity. Approximately 20 million Americans experience thyroid dysfunction and that number continues to rise. It’s estimated that 60 percent of individuals are completely unaware that they have a thyroid dysfunction. Hashimoto’s thyroiditis is an autoimmune disease in which the immune system attacks the thyroid gland. 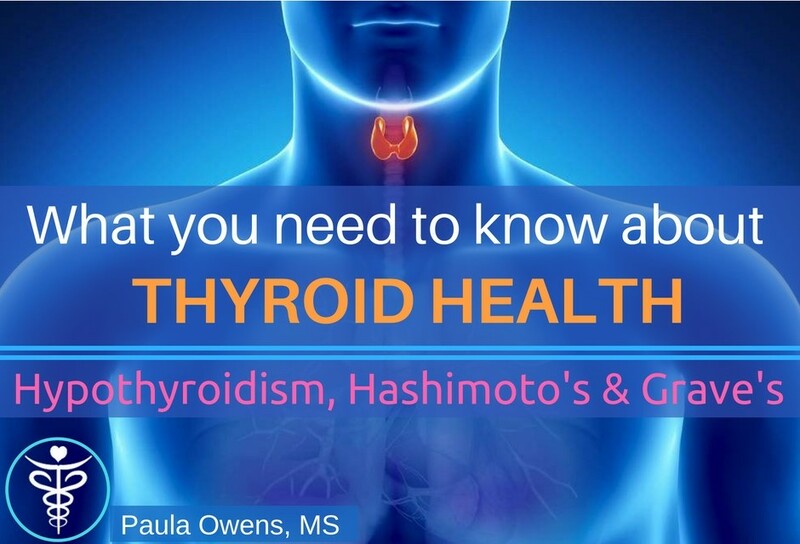 Hashimoto’s is responsible for approximately 90% of those diagnosed with hypothyroid. Numerous individuals with thyroid disorders have been improperly diagnosed or treated. Some of the early symptoms of thyroid dysfunction are mistaken for fatigue, depression, anxiety, headaches in the morning that wear off during the day, constipation, or the aging process. Left untreated, hypothyroidism dramatically increases risk of serious health problems and degenerative diseases. Thyroid stimulating hormone (TSH) is secreted by the pituitary gland in the subconscious brain. In early stages of hypothyroidism, the pituitary gland releases more and more TSH, causing elevated TSH levels. This causes the thyroid to work overtime to secrete more thyroxin, T4 and T3, the biologically active form of thyroid. Most of the T4 produced is converted to T3 by the liver. A thorough thyroid panel and other blood markers can determine if the thyroid is working properly, however subjective indicators must be taken into consideration and should not be overlooked. To most effectively screen for hypothyroidism and other thyroid imbalances, blood tests must include thyroid antibodies (thyroglobulin and TPO antibodies). Often TSH is the only lab value tested, which by itself is not a thorough screening of thyroid function. Data from a study of 25,000 participants whose TSH was measured argued that the ideal TSH level is 2 or less, not the usual 5.5 limit still cited by some labs. One study found that those with TSH values >2.0 have an increased risk of developing clinically significant thyroid deficiency over the next 20 years. Other studies show TSH values >1.9 indicate risk of autoimmune disease of the thyroid gland. Another study found TSH values >4.0 increase the likelihood of heart disease in postmenopausal women. Thyroid Stimulating Hormone (TSH). Be aware most all of the so called “normal” ranges are not healthy or optimal. Palpation and ultrasound. Insist that your doc does a careful head and neck exam routinely and an ultrasound regularly. Rule out underlying infections and heavy metal toxicity: viral infections such as Epstein-Barr and CMV, Heavy Metal Toxicity, and infections in the gut. Candida overgrowth, bacterial, SIBO, yeast and parasite infections, leaky gut, viral infections and Heavy Metal Toxicity are very common in those with hypothyroid, Grave’s disease and Hashimoto’s. It’s estimated that over 95% of thyroid disorders stem from Epstein-Barr virus (EBV) infection. Homocysteine. Clinical research has shown that increased homocysteine (>8) is found in many individuals presenting with thyroid hypo-function. Video: Do You Have Any of These Symptoms? My clients achieve exceptional results! I design bio-individualized nutrition plans and personalized healing programs for those with complex health challenges to those looking to improve their nutrition and age healthfully. Using a comprehensive approach to health, I identify the root causes of your unique metabolic and biochemical imbalances vs recommending a one-plan-fits-all approach. My philosophy is to use the most effective and efficient methods of natural healing, which means minimal testing and real-life, sensible solutions. I am available for distance coaching, consultations, clinical lab testing, blood chemistry analysis, mentoring, and nutrition & health coaching sessions. © Copyright 2019 Paula Owens. All Rights Reserved. The material on this site may not be reproduced, distributed, transmitted, cached or otherwise used, except with the prior written permission from Paula Owens, LLC. DISCLAIMER: The content on this website is for informational purposes only and is not intended to be a substitute for professional medical advice, diagnosis or treatment. Always seek the advice of your physician or other qualified health provider with any questions you may have regarding a medical condition.